This is plate 5 from 'The Ruins of Mandoo, the Ancient Mahommedan Capital of Malwah, in Central India' by Captain Claudius Harris. Dilawar Khan Ghauri, the Afghan governor of Malwa in central India, declared his independence from the Delhi Sultanate in 1401. His son Hoshang Shah Ghauri moved the capital of Malwa from Dhar to Mandu, christening it 'Shadiabad' or City of Joy. The mausoleum of Hoshang Shah is among the earliest Muslim buildings in India to have been encased in white marble. It was studied by Shah Jehan and his architects before they planned the Taj Mahal. Near the Jami Masjid in Mandu, it repeats the style of architecture of the Masjid's domed entrance chamber. 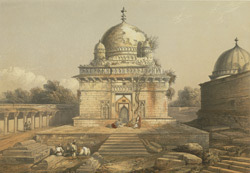 The rectangular building stands on a plinth, is covered by a large marble dome, and has small cupolas in the corners and arched windows decorated with perforated marble screens. Inside the mausoleum is the carved sarcophagus of Hoshang Shah.